What can you do about climate change? The better question might be: What can we do about climate change? University of California San Diego researchers show in a new study that framing the issue collectively is significantly more effective than emphasis on personal responsibility. 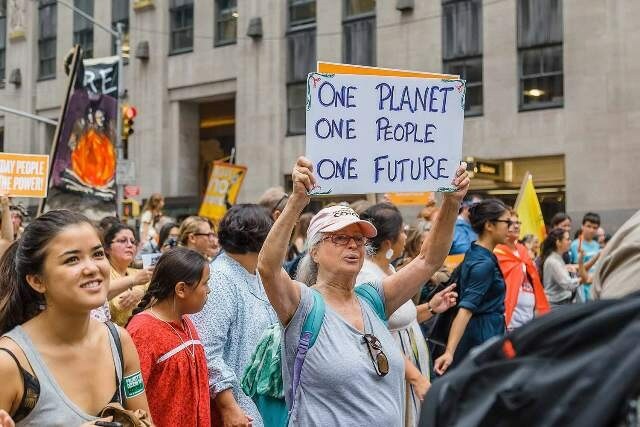 Published in the journal Climatic Change, the study finds that people are willing to donate up to 50 percent more cash to the cause when thinking about the problem in collective terms. Thinking about climate change from a personal perspective produced little to no change in behavior. The study’s findings run contrary to popular wisdom. Pick up a leaflet on global warming or Google around, and chances are you’ll find a “you” message urging action on the environment. Personal appeals are everywhere. Advocacy groups use them, as do the U.S. Environmental Protection Agency and the United Nations. A marketing campaign run by the European Union, for example, was explicitly focused on reminding people of their personal responsibility. “You Control Climate Change,” it declared. But is that the best way to go? When Obradovich realized that there wasn’t a lot of scientific literature examining whether collective or personal frames for climate-change action are more effective, he designed experiments to find out. Working with the National Audubon Society and co-author, fellow political science Ph.D. student Scott Guenther, Obradovich surveyed Audubon members as well as members of the general public. Participants in the experiments were randomly assigned to one of three scenarios: Some were asked to write a paragraph reflecting on the ways they personally cause climate change. Others reflected on the ways that climate change is collectively caused. Control subjects wrote about daily routines (brushing teeth, say, or drinking coffee). In this last case, no mention of climate change was made. Subjects had a one in 100 chance of winning $100 for completing the experiment. After writing – either about personal responsibility for climate change, collective responsibility, or their everyday activities – all of the participants were asked, should they win, how much of that $100 they would be willing to donate to Audubon’s climate-change efforts. The instructions made clear they would then win not the full $100 but the difference of their donation. The collective frame consistently outperformed both the personal frame and the control condition. Among the 1,215 Audubon members who volunteered to take part in the experiment, the researchers found those writing about collective causes of climate change were, relative to the control group, willing to donate 7 percent more of their potential winnings. Among 304 members of the general public, recruited through Amazon’s Mechanical Turk (MTurk), the donations were 50 percent higher, relative to control. Importantly, where the collective frame increased how much people were willing to donate, the personal frame hardly moved the needle at all. Put another way, asking people to think about how they themselves contribute to climate change had a similar effect on donations as asking people to think about brushing their teeth or going to work every day. The researchers ran a follow-up experiment. They re-contacted their original MTurk sample and asked them again how much they’d be willing to give. The effect persisted. People who had initially written about climate change in collective terms were still willing to donate more than the others, even several days later. Finally, Obradovich and Guenther ran survey experiments with a different group of 451 people, also recruited through MTurk, asking them to assess how they might change their future climate-related behaviors. Again, the collective frame did best – producing the highest aspirations for reducing carbon emissions. Why this occurs remains an open question, the researchers write. Further research is needed to investigate the psychological reasons more fully. Most of the Audubon members were game to give away all their potential winnings. The median donation among MTurkers, on the other hand, was about $10. The study is part of Obradovich’s doctoral dissertation at UC San Diego. After graduating, he will begin a joint postdoctoral appointment at the MIT Media Lab and Harvard University’s Kennedy School of Government. The research was supported by the National Science Foundation, grant no.DGE0707423, to Obradovich and by the Skoll Global Threats Fund to Obradovich and Guenther.